23 April, David Josefowitz Recital Hall, Royal Academy of Music. 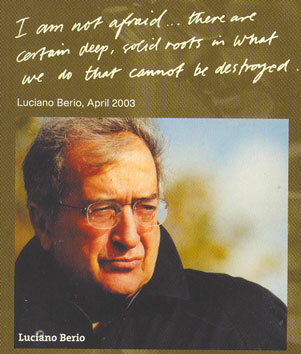 This posthumous celebration, planned with Luciano Berio himself before he died last May, is a comprehensive retrospective festival, spreading over a fortnight in several London venues and reported fully in the main media outlets, most of the major works available on recordings (109 entries in Amazon). Musical Pointers has chosen to cover some smaller events, overlooked elsewhere. A pleasant evening at the Italian Institute took in a recognition of the centenary this year of Luigi Dallapiccola, Luciano Berio's 'spiritual father'. The music of this pioneer serialist is not often heard in UK (there has been a welcome recent release of his opera Ulisse). Sarah Nicolls played sensitively Dallapiccola's Quaderno Musicale di Annalibera, composed for his daughter on her 8th birthday. Its dedicatee was present for the occasion to hear the pieces again at the Italian Institute. A group of Dallapiccola's lyrical Spanish settings, persuasively sung by Sarah Leonard with a 'white' tone quality, eschewing vibrato, were equally welcome. Sarah Nicolls, a forceful pianist, was only occasionally a little too loud for the intimate venue, a room which accommodated about 50. 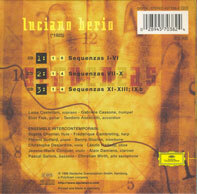 From the Berio Family Album we heard very early songs by Luciano and a charming one by his father Ernesto. Best was the ground-breaking solo Sequenza composed for Cathy Berberian, given with a confidential intimacy by Sarah Leonard, beginning the whisperings with which it began so quietly that I had the illusion that she was addressing me in the second row personally! Sequenza Masterclasses: Eliot Fisk/Eurico Pereira Sequenza XI; Teodoro Anzellotti/Milos Miliojevic Sequenza XIII. Master classes are as various as the teachers and their pupils. Advanced RAM students showed that Berio's oeuvre is likely to be secure in the hands of future generations, his solo Sequenzas key works delineating how the respective instruments developed during the 20th century. During the morning session, Eliot Fisk with guitarist Eurico Pereira was the most informative; most enjoyable for the audience Francesco d’Orazio teaching Pedro Meireles. Accordionist Teodoro Anzellotti's session with Milos Miliojevic on Sequenza XIII was hampered by his reliance upon an interpreter, to whom he made long asides, too lengthy for full translation, turning away from his victim, who was rarely allowed to play more than a few notes before being interrupted. We were able to appreciate the infinite subtlety of tone and articulation which can be drawn from the concert accordion, but not the piece as a whole. How should audiences be treated in these public classes? The Masters certainly should not indulge themselves by 'playing to' the audience; none of these did so. You had to be very close to catch all that Fisk said to Eurico Pereira; for much of the time they were playing along together. Fisk shared his enthusiasm, marvelling about the miracle of how Berio got his own language into the guitar; doing so costing him more time than all the other Sequenzas together! It is 'perfect flamenco writing, exactly right, unbelievable'. As did the other teachers, he stressed the paradox that the writing is precise (they all urged obediance to the tempo markings) yet the playing must be 'correct but not mechanical'; Berio was pragmatic with suggestions about details in the score, 'pragmatic and flexible like Bach',and Fisk showed how the music has to beathe, giving a (false) impression of improvisation. 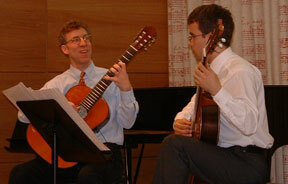 Francesco d'Orazio's session with Pedro Meireles (violin) was ideal. Rapport was relaxed with this gifted and responsive student, d'Orazio's sonorous voice carried to the back of the ideal 100-seat new recital hall, and though there were no 'jokes', the audience was animated and their faces were continually wreathed in smiles of pleasure. D'Orazio demonstrated the need for strict tempo by reference to the Chemin with orchestra which has an identical violin solo part, but with no possibility to vary or alter the tempo under a conductor's control. I think we all felt we got to know this Sequenza VIII well during the lesson. Sequenza Concert: Sequenza XIII Teodoro Anzellotti, accordion; Sequenza IXb Claude Delangle, saxophone; Sequenza VIII Francesco d’Orazio, violin; Sequenza XI Eliot Fisk, guitar. It was good to hear these expert musicians performing a sequence of Sequenzas, but I felt (not for the first time) that this is not good programme building. One of them is always welcome as an item in a recital, but it is frustrating to have such marvellous musicians each restricted to one unaccompanied solo piece. They can be heard in the fine Deutsche Grammophon boxed set of the fourteen Sequenzas completed by 1998; no doubt the last of the set for cello, premiered in this festival by Rohan de Saram, will soon appear on disc.